The huge advantage to buying gold this way is that you won’t have to deal with some possibly shady 3rd party. With Bliz running the show there is no chance for account compromise, either from an account hack from said 3rd party or from Bliz shutting your account down for gold buying. It’s likely that this will put a dent on the 3rd party gold market, but it won’t kill it. My guess is that the gold sellers will undercut bliz. You will get more gold for the same or fewer bucks. Your choice will then be to go the dangerous route (risking that account hack or ban) and get more gold or go the safe and approved route. A lot of the gold that’s sold comes through hacked/stolen accounts and from farming bots and this new program should help to put a dent in that, though I doubt it’ll kill it. Have a lot of gold, but not so much real cash? You can buy these game tokens off the Auction House for gold, at a set price, and they’re then immediately bound to your account and you are credited with 30 days time. There will be a dedicated Token Exchange on the AH to handle all these transactions. Any token can only be sold once and you will receive it about as soon as you buy it, just like any other AH bought item. 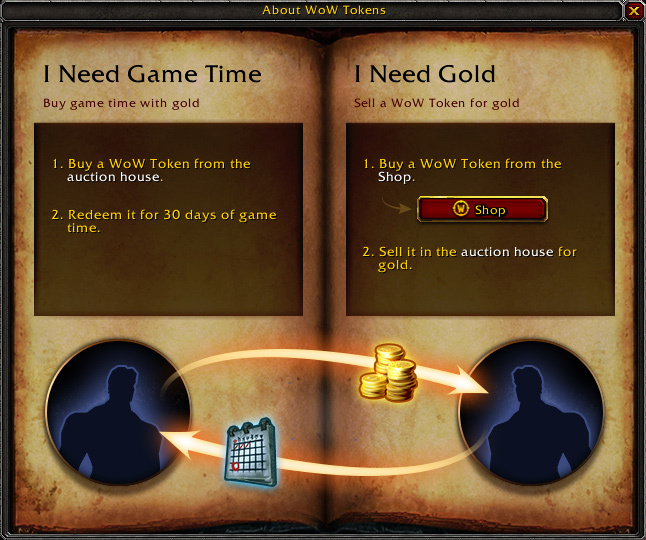 The WoW Token was created to give players with lots of extra gold the option to use it to help cover their subscription cost, and give those who want to purchase gold a way to do so from fellow players through a secure, easy-to-use system. The Token will be making its debut in an upcoming patch. The original post, with all the FAQs and hundreds of comments, is on BattleNet. Buy a token with real money and then either use it or sell it to someone else for gold. Quick and easy. I understand the the token often sell in very little time. You might get the gold from a seller faster, maybe, and you might get more gold for each dollar you spend. The issue is trust. Do you trust your (would be) gold seller as much as you do Blizzard? Of course, you could put in some work to earn that gold and save your cash.